← Revealed: ‘True Bersih Girl’ who advised Maria Chin about putting on make-up had plastic surgery in Taiwan. 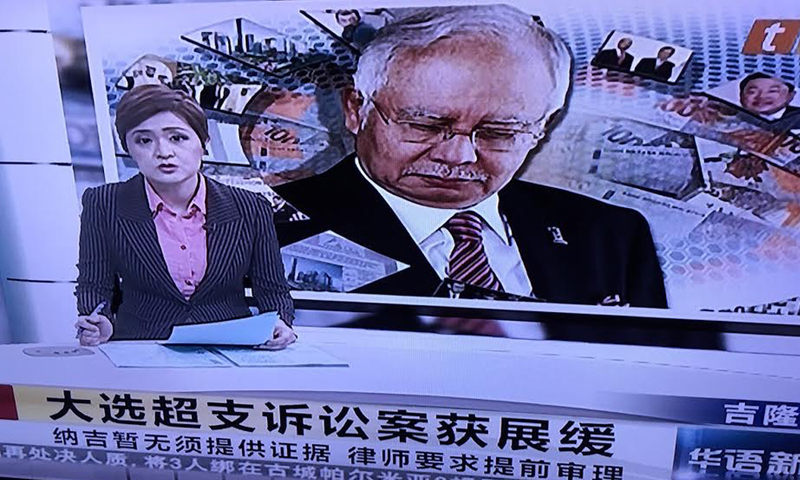 End to 3-day punishment of RTM Mandarin news team for using ‘downcast’ photo of Najib? DID THE ‘ORDERS’ COME FROM THE HIGHEST LEVEL? OR WAS SOMEONE INSIDE RTM TRYING TO CARRY BIG LEG? Communications and Multimedia Minister Salleh Said Keruak has agreed for the state broadcaster RTM’s Mandarin news programme to be restored to its original format, says MCA deputy president Wee Ka Siong. Wee said the return to the status quo was agreed upon after he communicated with Salleh on the matter, according to Oriental Daily. He added that Salleh had issued the necessary instructions to the Mandarin news programme to be restored as before. However, a check on TV2’s Mandarin News broadcast at 8pm today found that it had not completely return to normal as the headlines in Chinese were still missing and the backdrop remains static. Behsaikong: The phrase “afraid of one’s own shadow” comes to mind. When, how and why has today’s Malaysia become so sensitive, intolerable and over-reactive? How come? We need as a nation to hang loose a bit, relax and act a little more confident. Super-fast (and over) reaction ironically makes people even more suspicious. Wira: RTM is a propaganda machine of the state. Such punishment is like cutting one’s nose to spite one’s face. If anyone should be punished, it’s the individual who issued the ‘ban visual’ instruction. Anonymous 405401436586659: There is nothing wrong with the photo because it reflects PM Najib Razak in his current ‘broken’ state with no way to go but down. I doubt he will last long because the knives are out in Umno. The rest of the collage shows his team – Jho Low and friends. Anonymous 29051438068738: That should be the only photograph used every time he is mentioned. It says everything Malaysians have come to know of him – from Scorpene submarines to Altantuya Shaariibuu’s murder to 1MDB. GE14NOW! : It looks like we have a cult regime similar to that of North Korea in the works here. But what’s the problem with a photo anyway? Whether he looks handsome or not, he still looks bad. It is incredible the depths to which his minions will go to lick his boots. Kangkung: Things like this only happen in countries rule by despots. A despot always needs to be placed on a pedestal with his retinue perpetually placating him. Anonymous$&@? : “Meanwhile, Communications and Multimedia Minister Salleh Said Keruak said he was not aware of any such directive coming from the ministry level,” said Malaysiakini. The reason our country is in a mess is because the head doesn’t know what the bottom level is doing. This situation can be seen across all government departments and the end result is a half-past-six government running the country. Old Timer: He can’t be a good minister for communications and multimedia if Salleh does not know what is happening. May be another person (from Umno of course) who can be a better minister. If one were a newscaster, what is it like to be ‘punished’ by being made to read the news for almost 20 minutes straight without breaks for video footage? This was the fate that has befallen Mandarin newsreaders at state-owned RTM, following a purported ‘punishment’ meted out onto their newsdesk. “Pure talking only by me on Oct 29. […] I made history,” RTM Mandarin newscaster Liew Chin Yip quipped on his Facebook page. Meanwhile, Teo Chong Lim, who read the afternoon news, wrote on his Facebook page that it was positive experience, in terms of facing job challenges. “To determine the level of a news presenter, it is whether he can still remain calm when being harassed,” he posted. The newscaster slated for tonight’s segment was more gung-ho. “No matter whether it is a crisis or a favourable turn, (I’ll) go all out at 8pm,” wrote Goh Sook Fang, who is on tonight’s Mandarin evening news over RTM2. The Mandarin news team of state broadcaster RTM took another ‘beating’: this time its news was aired without Chinese superimposed headlines. Starting yesterday, the Mandarin newsreader had to read the news without any accompanying video footage. At noon today, the 20-minute programme was aired with only superimposed news headlines in Bahasa Melayu. Usually, the superimposed headlines are run bilingually. At the moment, the reason for this further ‘punishment’ is unknown, but sources familiar with the TV industry ruled out technical glitch. Malaysiakini reported yesterday that the Mandarin news team of state broadcaster RTM has been ‘punished’, purportedly for airing an unflattering photograph of the prime minister. ” Tv2″ Chinese news program starting from yesterday was instructed to disable pictures and images to cater for the webcast news! The Mandarin news team of state broadcaster RTM has been ‘punished’ purportedly for airing an unflattering photograph of the prime minister. 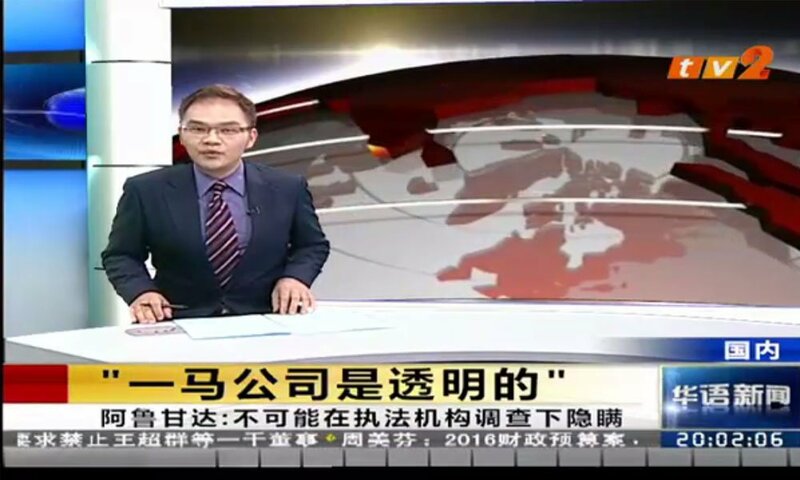 According to Chinese news reports, the RTM Mandarin newsreader was made to read the report without any accompanying video footage for the whole 20 minutes of the programme aired at noon today. RTM’s head of Mandarin news Tan Lee Won confirmed to Malaysiakini about the directive banning the Mandarin news team from using any visuals. Tan said the directive – issued by RTM’s management yesterday – took effect today for both its Mandarin news programmes at 12pm and 8pm. She declined to reveal the reason given, adding that she did not know when the ban will be lifted. Sources however claimed the punishment was due to the news team’s usage of a photograph of Prime Minister Najib Abdul Razak in its 8pm broadcast on Tuesday. The image was displayed when the RTM Mandarin newsreader was reporting on Najib’s successful bid in staying PKR’s lawsuit against him for allegedly breaking general election spending regulations. The image, which was produced by Malaysiakini, showed Najib looking down solemnly, with a collage of other photographs related to 1MDB in the background, including a picture of Penang-born billionaire Jho Low. This entry was posted in najib razak, RTM nandarin news team punished for sad photo of najib, RTM news crew punished and tagged for using photo of downcast najib" RTM mandarin news team punished, Najib Razak, RTM. Bookmark the permalink.